The Centurion Action X is a British tier 10 medium tank. Replaced the FV4202 in patch 9.12. 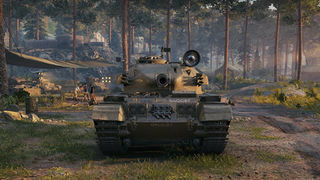 Hard-hitting medium tank with great aiming time and decent mobility, While Action X turret provides decent protection. But, With its large size, It was vulnerable especially against SPG if you're not moving around. The Centurion Action X marks the end of its British medium line. Prone to module damage, especially the ammoracks in the front hull and sides, often losing the tracks by the same hit. The Centurion Action X is a significant upgrade from the Centurion 7/1 in every aspect and a further refinement of the play style. It retains the excellent gun depression and powerful L7 gun of its predecessor, but with greatly improved mobility, greater accuracy on the move, and even better turret armour. All this combines to make a tank well suited to the hull-down style of its predecessors, but now with the option for rapid flanking and firing on the move as well. Still, the Centurion Action X does not have the armour to stand up in a prolonged fight against powerful tier 10 guns, even hull down, so making use of the upgraded speed and mobility is essential. However, while the Centurion AX's upgraded mobility can allow it to brawl if necessary, the Centurion AX is a long range fighter at heart. Its large size coupled with moderate DPM compared with other tier 10 mediums make brawling a dubious proposition at best. 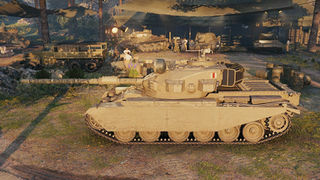 The Centurion Action X is best suited for combat on hilly terrain; by making use of its 10 degrees of gun depression, the Centurion Action X can hide its massive lower glacis, and significantly increase its turret armour. 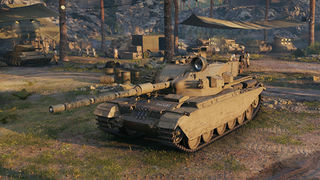 When using all ten degrees of gun depression, even weak spots such as a plate just above the gun, or the plate directly below the gun, can reliably bounce shots from most tanks. Though it has an abundance of hitpoints, the Centurion AX is best suited for the second or third line of tanks, supporting the team's heavies, or playing like a turreted td. Players who love the Centurion 7/1 will find the Centurion AX a most satisfying tank to play, allowing a greater array of play styles due to its good maneuverability, at the expense of a large chassis with mediocre armour. 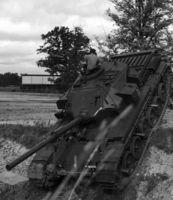 The history of the Centurion Action X started in 1955 - as a part of the development work on the vehicle a new turret was proposed. The main difference between the old Centurion turret and this new one was the absence of gun mantlet (that on the Centurion covered most of the frontal turret area). 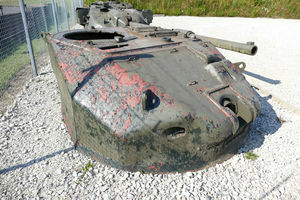 This solution allowed the frontal turret part to have much more sloping, which significantly improved the shell protection. This turret was proposed to be equipped with the 105mm L7 gun. The Action X program assumed only the development of a new turret, the hull was supposed to be the same as the one of the contemporary Centurions. 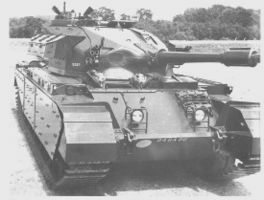 Two turrets were made as a part of the program: one, fully equipped, was put on a Centurion Mk.7 hull and underwent series of complete mobility trials. As far as we know, this vehicle didn't survive to this day. The second turret however did - this one may have been used for firing trials (shells were fired at it to determine how resistant it is). It suffered only minimal damage and currently sits at Bovington. The surviving Action X Turret. The Action X Centurion during trials. This page was last modified on 25 July 2018, at 15:41.